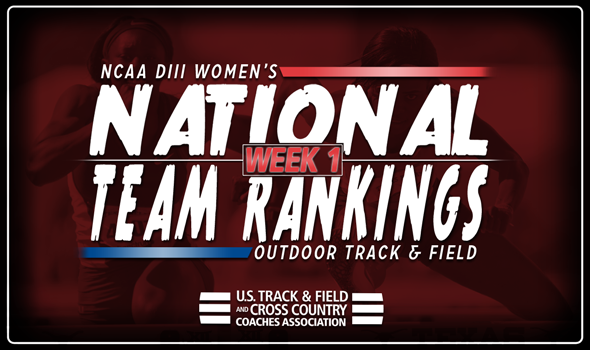 NEW ORLEANS – Everything changed in the NCAA Division III Women’s Outdoor Track & Field National Team Rankings between the preseason and Week 1. The most recent index, released Tuesday by the U.S. Track & Field and Cross Country Coaches Association (USTFCCCA), saw a brand-new top-7 and one new addition to the top-25. Williams took over the top spot in the rankings for the first time in program history. The Ephs added three top-10 marks in the USTFCCCA Individual Rankings to their ledger in two weeks, including the second fastest 4×400 relay in the nation (3:51.26). Claremont-Mudd-Scripps came in at No. 2, a spot it occupied eight times in the past two years. The Athenas own three top-5 marks nationally: Emily Bassett in the hammer throw (No. 2, 58.90m/193-3), the 4×100 relay (No. 2, 47.50) and Bryn McKillop in the 1500 (No. 4, 4:26.72). George Fox soared 14 spots from No. 17 to No. 3, which hit a program high. The Bruins saw two blistering times by relay teams: the top-ranked 4×100 mark of 46.89 and the third-ranked 4×400 mark of 3:52.42. Washington (Mo.) moved closer to its customary No. 1 spot after climbing 10 spots from No. 14 to No. 4. The Bears, who have been ranked No. 1 14 times in the past three years, are paced by the duo of Paige Lawler and Aly Wayne in the 10,000 and a strong 4×400 relay. Ohio Northern jumped one spot in the top-5 after Emily Richards turned in a dizzying time in the 1500 at the Raleigh Relays. Richards traversed the track in 4:15.77, which stands as the third fastest time in NCAA DIII history and put her atop the Descending Order List. Emory matched its best ranking in program history after it took over the No. 6 spot. The Eagles feature the top-ranked 4×400 relay at 3:47.35 and the fourth-ranked 4×100 relay at 48.38. Whitworth is the final team in the aforementioned new-look top-7. The Pirates received a sterling effort from Isabel Clark two weeks ago in the heptathlon as she is now ranked No. 4 in that event in the Individual Rankings. Redlands was the only new addition to the top-25 at No. 24.